Marshall County’s Kobey Yates won the elementary 1600 meter race at Noble Park Saturday by 11 seconds over his competitors. 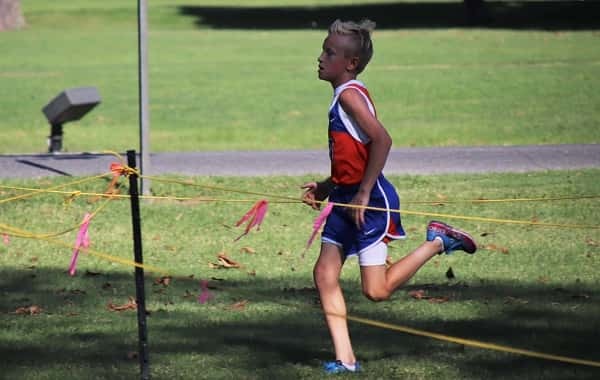 Marshall County cross country fielded a middle school team and a few super fast elementary runners Saturday at St. Mary’s Invitational held at Noble Park. Ethan McCarty captured the win in the boy’s middle school 4K race in 14:31.06 and the next fastest time for the Marshals came from Zion Miller in 28th with 17:56.89. 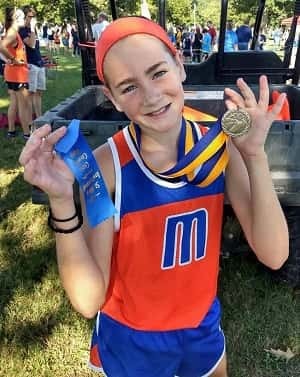 Addison Lyles recorded the fastest time for the Lady Marshals in the girl’s middle school 4K taking sixth in 19:26.64. Eden Sandlin finished second in the girl’s 1600 meter elementary race in a large field of 117 runners. Also finishing for the Marshals; Andrew Lanham 65th, Dallas Sutherland 67th, Jesse Jones 86th, Walker Jones 98th, Christian Jones 110th, Keifer Siress 112th, Isaac Lanham 119th, Canyon McKenty 122nd and Micah Hancock 136th. Rossview Middle School runner Cassandra Rosencrants took the win in the girl’s middle school race in a time of 17:45.59. Behind Lyles sixth place finish for the Marshall Middle girls; Elizabeth Barrett 18th, Laney Beth Jones 24th, Addy McKenty 35th and Libby Gallagher 52nd. Rossview Middle took first in the boy’s race and Marshall Middle placed eighth. Graves Middle won the girl’s race and the Marshall Middle girls took second. Marshall County’s Eden Sandlin placed second in 6:59.79 in the girl’s 1600 meter elementary race among a field of 117 at the start. St. Mary’s Gabby Ault finished first in 6:50.79. Kobey Yates took first for Marshall County in the boy’s 1600 meters in 6:11.23 and Austin Lyles placed 12th in 6:54.88 among a field of 142. The team from Apollo swept both the girl’s and boy’s varsity races and also claimed individual firsts from Thomas Ashby in 17:31.57 and Sammi Roberts in 21:02.65. Marshall County will host the Marshall County Invitational Saturday, September 22nd.